We carry drums made by primarily by George Carroll and Florance Drum Company. 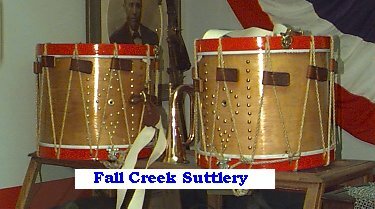 These Drums are at the top of the competitive range of CW period drums. Both makers have made drums for years and their products have consistent quality. Each hoop and body is bent by traditional methods, and all construction employs period techniques with modern technology. We sell quite a few drums each year, and are proud to offer Drums made by these companies. 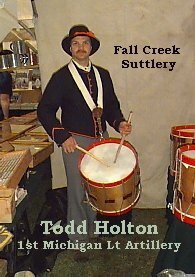 The most commonly used CW Period drum is the 16" X 16", 16" X 18" and 13" X 16". The most popular seller today is 16" X 16". 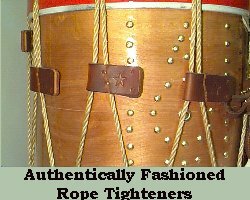 These feature natural wood sides, colored hoops (red predominately), rope with leather tighteners, bottom snare, and a hanging device. 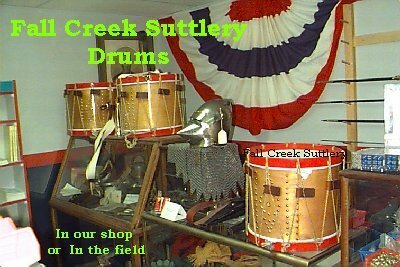 We stock drums with "Fiberskin Heads" for better stability during humidity and climatic changes. The ropes we use, while natural looking, are synthetic to avoid the climate changes as well. It is difficult to tell these departures from the original unless under close scrutiny. Each drum bears it's own unique serial numbered period type label on the inside (viewable through the weep hole) which includes the date of manufacture, as well as the makers signature. You will be proud to own one of these drums.